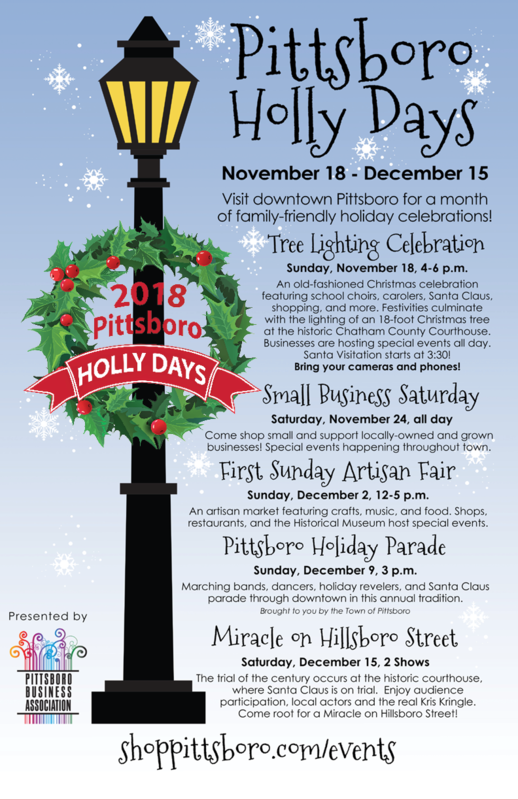 Visit downtown Pittsboro for a month of family-friendly holiday celebrations! Special events happening November 18 – December 16. Check our full event calendar for even more. Sunday, November 18, 4-6 p.m.
An old-fashioned Christmas celebration featuring school choirs, carolers, Santa Claus, shopping, and more. Festivities culminate with the lighting of a 18-foot Christmas tree at the historic Chatham County Courthouse. Businesses are hosting special events all day. Santa visitation starts at 3:30! Don’t forget to bring your camera/camera phones. Come shop small and support locally-owned and grown businesses! 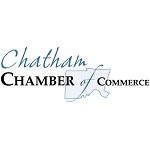 Special events happening throughout town. Sunday, December 2, 12-5 p.m.
An artisan market featuring crafts, music, and food. Shops, restaurants and the Historical Museum host special events. Marching bands, dancers, holiday revelers, and Santa Claus parade through downtown in this annual tradition. Brought to you by the Town of Pittsboro. Saturday, December 15, 2 p.m. & 4:00 p.m. Performances will be at 2pm & 4:00 pm.